A/N: The article I wrote covering the PLF writing forum was published in School Times today, and I also have an article in Niexter, so be sure to get a copy! 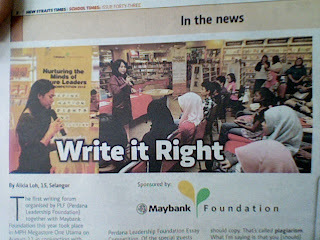 The first writing forum organized by PLF (Perdana Leadership Foundation) together with Maybank Foundation this year took place in MPH Megastore One Utama on August 11 2012, in conjunction with this year’s Maybank Foundation-Perdana Leadership Foundation Essay Competition. The special guests who spoke were Lydia Teh, author of six published books, including Honk! If You’re Malaysian, and Kenny Mah, whose blog Life For Beginners is one of the longest running blogs in the nation. Lydia began the talk first, sharing some passages written by famous authors such as Bill Bryson, and showing what makes each of them unique, telling us that it is their style that makes their writing easy to pick out even before you know who the author is. Both writers underscored the importance of both reading and writing, as it is through practice that one hones the skill. Lydia also gave a rather interesting piece of advice, and that is to emulate the style of other writers. “I’m not saying you should copy… That’s called plagiarism. What I’m saying is that you [should] copy the style, what sort of tone…” Next, she advised writers to keep their audiences in mind. People have different ways of talking to people of various ages, and this should translate onto paper, too. “Use the right words,” she added. As for why young people should write, “It’s a means of escape,” answered Lydia, “And when you write down things, it helps you analyze.” For Kenny, writing is important to record events in one’s life, and the things that shape a person. If you’re interested in writing, or want to find out more about it, PLF has another writing forum scheduled on the September 30, in MPH Megastore. As for the Essay Competition, the Grand Prize winner will walk away with RM8,000, whilst the other winners will also receive attractive prizes. The deadline for the competition is October 31, 2012. You can read the details at www.perdanaessaycompetition.com.my. 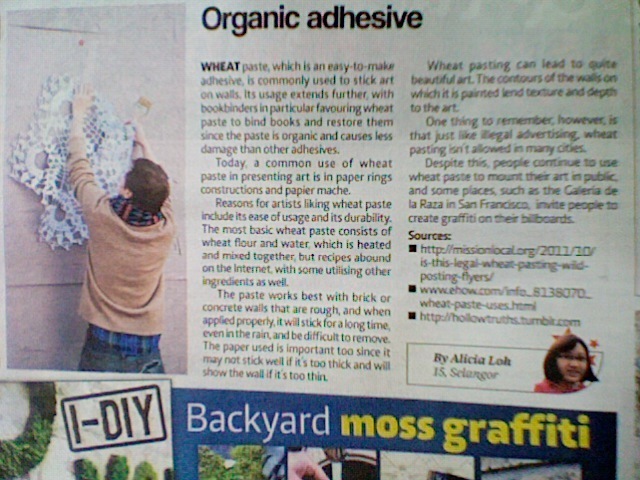 Wheat paste, which is an easy-to-make adhesive, is commonly used to stick art onto walls. It usage extends further, with bookbinders in particular favoring wheat paste to bind books, as well as restore them, since the paste is organic, and causes less damage than other adhesives. Going back to street art, the reasons that artists like using wheat paste include its ease of usage, along with durability. The most basic wheat paste consists of wheat flour and water, heated, then mixed together, but recipes abound on the Internet, with some utilizing other ingredients as well. The paste works best with brick or concrete walls that are rough, and when applied properly, will stick for a long time, even with rain, and be hard to remove. The paper used is important, too, as it may not stick well if it’s too thick, and will show the wall of it’s too thin. Wheat pasting can lead to quite beautiful art, with the contours of the walls the art is painted on lending texture and depth to it. One thing to remember, however, is that just like illegal advertising, wheat pasting isn’t allowed in many cities. Despite this, people continue to use wheat paste to mount their art in public, and some places, such as the Galeria de la Raza in San Francisco, invite people to create graffiti on their billboards.